If you’re building your own M4, you already know how important it is to find the right lower receiver for your carbine. This is arguably one of the most vital parts of any build, as it can affect everything else on the gun. Check out this guide for some great advice on the different types of lower receivers available for purchase, along with some recommendations for excellent receivers that we really enjoy for our carbine builds. Before we get into the details, let’s discuss the major types of M4 lower receivers you might find. These will affect how your weapon works, so it’s important to know what distinguishes them from one another. These are the most common lower receivers you’ll find on the market. They’re generally considered to be strong and well-priced. 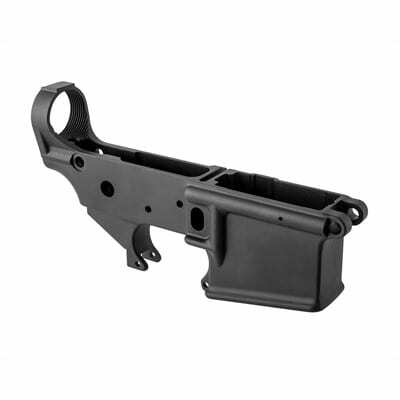 Forged lower receivers are made through an involved heat-hammering process that results in most products coming from a few manufacturers, which are then distributed by numerous vendors. 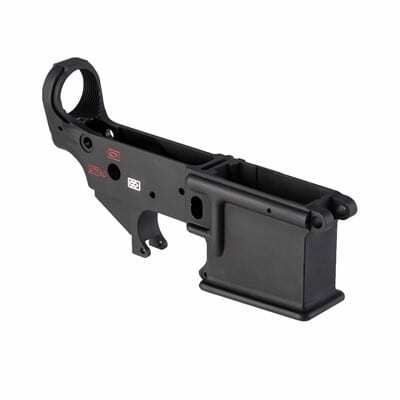 Most forged lower receivers are similar to one another and are generally dependable. These are made from aluminum billets and are made painstakingly to ensure quality and precision goes into the construction. 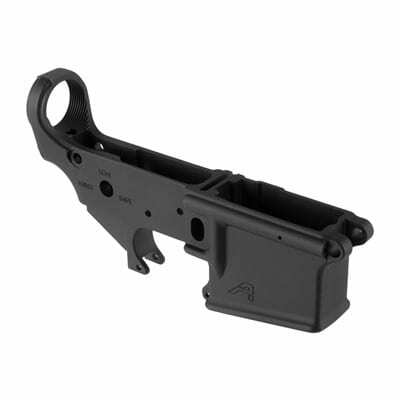 Because of the time and labor required, these tend to be a bit more expensive than forged lower receivers. These receivers can offer more customization and allow you to tweak your receiver’s performance more than a standard forged lower receiver. These are made from injection molding processes with hardened polymer resins. Bolstering may be added as the resin solidifies in the shape of the receiver to improve the piece’s strength and durability. This results in a lighter type of receiver than many competitor models and a cheaper one for you, the buyer, since the materials used in construction don’t usually cost very much for the manufacturer. These receivers aren’t technically considered to be a firearm by regulations from the NICS or FFL, so you can order these whenever you like without having to go through an inspection. These receivers do need more involved tools to install in your carbine than other types, such as a drill press or router. If you’re building a rifle from scratch and have the know-how, this might be a good pick for you. What Makes a Great M4 Lower Receiver? When you’re picking out your lower receiver, make sure to keep these factors in mind. Choosing a receiver that isn’t right for your carbine can lead to wasted time and money on your end, so take the extra minute now and remember these considerations. As we discussed above, the type of receiver can affect the durability or weight of your receiver, as well as overall cost. Try to determine which type you’ll go after first before you start shopping. These are things like tension screws or flared magwells (magazine wells) that can affect your weapon's performance and lifespan. If you've got any key things you want to be included in your carbine, think of them now so you can eliminate receivers that don't have those features. Always try to find a receiver that has the durability or weight you prefer. If you plan to fire a lot of rounds, perhaps lean towards heavier or more durable materials that will make your rifle heavier but last longer. Finally, look for a receiver made from a trusted, well-vetted manufacturer that has a customer base that trusts their work. You can always look at reviews for details. Now that we’ve got all the preparatory information covered, we can start to check out some the best M4 lower receivers on the market. Even if these don’t quite fit the build you have in mind, they’ll be great starting points for searching for the ideal lower receiver for your weapon. 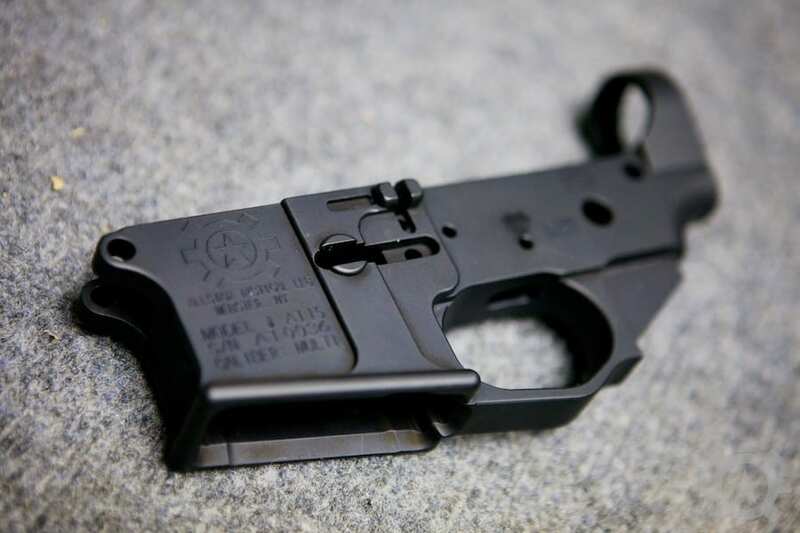 This is a fantastic lower receiver that is a perfect fit for the vast majority of gun builds. Since it’s made to military standards, you can rest assured of the receiver’s quality and durability under fire. This means that it’s going to fit most people’s M4 templates, but that it also isn’t the best for custom builds that eschew some traditional construction methods. As far as standard lower receivers go, this is an affordable and reliable piece. It’s made from aluminum in the billet style, so the affordable price is doubly good to see here. You’re getting assured durability and reliability because each piece of the lower receiver was made slowly and to perfection. There are some great markings for your firing setting selector: safe, semi-automatic, or burst. Since these are already engraved you won’t have to finish that touch yourself. The entire receiver is finished with a matte black color that elicits authenticity and military ruggedness. This receiver is as close to the military-issue M4 rifle as you can get without purchasing the real thing as a whole piece. This makes it a great choice for collectors or if you’re reserve or active military and want to replicate the feel of your original rifle that you used during your service years. This is a well-built receiver that’s made to last and whose every bolt was crafted to perfection. It’s made in the military style to adhere as closely as possible to normal M4 templates and has markings for your various firing settings. The Brownells Lower Receiver is built with an interesting combination of methods. Brownells started with an aluminum build to imbue the receiver with a lighter-weight frame and to emulate the style of traditional military-style receivers. After the general mold is finished, the receiver is then machined to mil-spec dimensions to perfectly match the type of receiver used by traditional, issued M4 carbines. This receiver is military spec just like the first receiver we reviewed, although this more expensive version is lighter in weight and slightly more durable thanks to its more specialized aluminum construction at the beginning of the process. It’s still very close to the “real” thing and is designed for use with standard 5.56 rounds. A matte black finish allows it to fit into any carbine that’s going after the traditional military look, although it lacks the engravings that the previous model had for your firing mode. You’ll have to add those yourself. This receiver is very versatile and can work with a staggering number of M4 builds, including Models 618, 629, 630, and so on. Visit the site and see if your template is among the builds this receiver is good for; in terms of value for money, this receiver is hard to beat. The Brownells Lower Receiver is a great aluminum piece that’s made to military specs to imbue the receiver with durability and efficiency. It’s good for the common 5.56 rounds that most people will use in their M4 and is finished with a black matte coating. Here we have an aluminum-forged receiver that's built differently from the mil-spec models we've looked at so far. It can chamber many different kinds of rounds, depending on your upper receiver and the barrel that you install on the carbine. This makes it a great pick if you’re going to customize your build or are experienced enough to start making an M4 from scratch. The receiver has a smooth nickel finish that allows it to slot very easily into existing uppers. The trigger is a lot smoother than triggers you’ll find on military spec lowers that also come with a trigger. In addition, you can choose between two different engraving choices: safe/fire or a pictogram style that doesn’t rely on English. This can be handy if English isn’t your first language or if someone who doesn’t read English might be handling the weapon. Because of the greater focus on personalization and customization, this is a better pick for experienced M4 tinkerers instead of beginners. It is a bit expensive compared to some of the other receivers we’ve looked at, but you’ll find that it’s well worth the cost due to its lightweight build (from the aluminum forging) and durable construction. It’s a piece that’s designed to last and work with your original build rather than force you to conform. This receiver has a number of great features that make it ideal for more custom M4 templates, including the ability to work with many calibers of rounds, two engraving options, and a smooth nickel finish and smooth trigger. 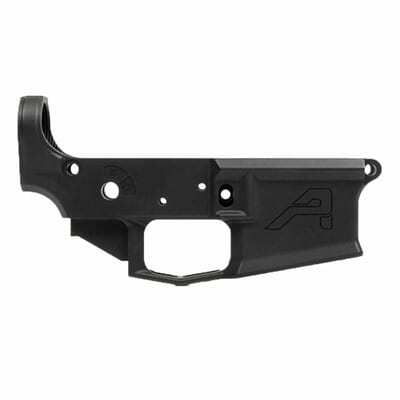 This receiver is made from a forging from Germany and is molded out of a different shape than the standard AR-15 model. Instead, it's forged from an HK416 shape and then machined to be as authentic to an AR-15 model as possible. The result is a bit of an amalgamation between the two receiver types that might find a home for M4 enthusiasts looking to switch up the look of their new rifle or experiment with different configurations. This means the receiver can be used for custom AR-15s or HK416s. It can’t be used with certain parts, like Surefire 60/100rd magazines, but so long as you check the site to make sure that your build doesn’t have any of the disallowed pieces you’ll be fine. The receiver has markings on the side to denote your firing setting in the style of the KH416 model, further melding the two types if you choose to use this receiver in your rifle’s build. The finish is anti-corrosive, so even if the weapon gets wet it won’t succumb to corrosion damage as quickly as receivers without is distinctive finish. There is a bit of a backup sometimes if a lot of orders come through and the receiver is worth a good chunk of cash, but in terms of high quality, you'll find nothing better. 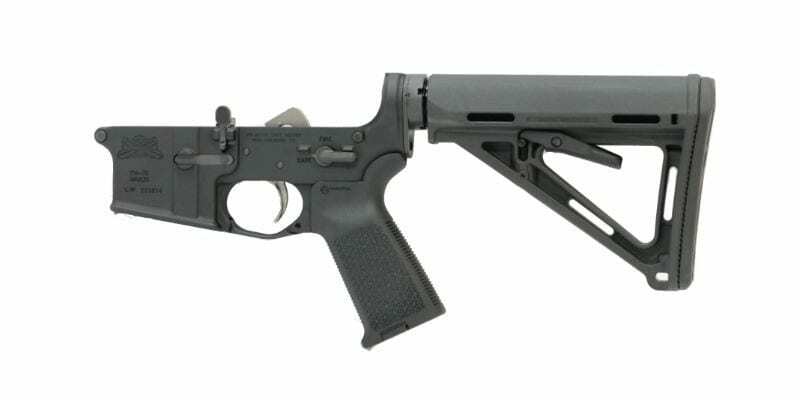 Ultimately, grab this receiver if the mixing of the AR-15 and HK416 styles appeals to you. This receiver is made from a forging for an HK416, then machined to work for an AR-15. This gives it a distinctive look and feel, as well as long-lasting durability. It’s pricey but worthwhile if this customization is something you like. Finally, this receiver is forged from an extra-strong aluminum base that’s machined to look like a mil-spec model like the kinds at the beginning of our reviews. However, due to its custom shape, it’s much sleeker and smoother than a lot of military receivers and has slightly lower weight while still retaining great durability. It’s classified as “stripped”, but it actually retains a few extra pieces that don’t normally come in stripped lowers. These include an extra-wide triggerguard that gives your gloved fingers plenty of room to rest and maneuver without getting caught and an easy-install threaded bolt catch roll pin that can reduce your chances of harming the lower as you install it. It has a flared magwell opening for quickly swapping magazines. The receiver will work with most mil-spec AR components, so customization options are pretty versatile so long as the general build follows a spec that’s close to military standard. It’s also great for combining with pistol grips and other modifications. The black finish is anodized to resist wear and corrosion, furthering the receiver’s lifespan. You get all of this functionality for a really affordable price, too. This is a great option if you’re into customization but don’t want to get too crazy with it and like the general outline of mil-spec receivers. There is a large “A” engraved on the receiver that might not suit your style, but you can always paint over it if you like. This receiver is a top-of-the-line model that is machined from a custom aluminum forging and machined to match military-spec builds. It’s combinable with most standard mil-spec components and has an anodized finish to reduce wear and tear. Furthermore, it comes with a very wide triggerguard despite being stripped, as well as a flared magwell for fast magazine swapping. With this guide, you should have everything you need to complete your carbine build and get a great M4 out of your effort. There’s a good lower receiver for anyone and any type of rifle, from standard military-spec models to custom builds that are the envies of gunsmiths. Check out some of our other guides for other advice when building or repairing your M4 carbine.